Made from a soft rubber material, these plugs are easily cleaned and reused. Neck cord can be removed/replaced easily to accommodate users who prefer to use the plugs without the cord. These plugs come with a convenient carrying case for storage or the case can be attached directly to noise generating devices (eg. the handle of a lawnmower, etc.) to help keep the plugs clean and ready for their next use. Tested in accordance with ANSI S3.19-1974. Soft, low ear pressure plugs are comfortable for a variety of activities. Easy-to-roll foam easily inserts into ear and then expands for a comfortable, custom fit. Noise Reduction Rating (NRR) of 31. Used in applications such as mowing/trimming lawn, power tool use, traffic and office noise or sleeping in noisy rooms. Tested in accordance with ANSI S3.19-1974. Heavy-duty durable malleable steel frame. Copper coated steel screw with swivel pad. Baked gray enamel finish. Self-adjusting foam provides low pressure with attenuation dermatological safe foam non-irritating to the skin. Self-adjusting foam provides low pressure with attenuation dermatological safe foam non-irritating to the skin. Larger handle on this c-clamp makes it easier to apply torque for more clamping pressure with less hand fatigue; double-threaded screw reduces screw deflection and drift for faster clamping and allows you to apply 50% more clamping force than with most clamps; for woodworkers, carpenters, welders, builders or do-it-yourselfers; suitable for general clamping needs; larger swivel pad reduces marring on work surface and increases stability. Triple flangestyle earplugs with cord. Washable, comes with a reusable storage container. Meets ANSI S3.19-1974, NRR 21. For Use In: Swimming, Operating Heavy Machinery, Power Tools, Target Practice & Sleeping. Heavy-duty durable malleable steel frame. Copper coated steel screw with swivel pad. Baked gray enamel finish. Double-rolled thread for faster clamping and increased durability. Larger swivel pad reduces marring on work surface and increases stability. Larger handle for greater clamping pressure with less effort and reduced hand fatigue. Larger handle on this c-clamp makes it easier to apply torque for more clamping pressure with less hand fatigue; double-threaded screw reduces screw deflection and drift for faster clamping and allows you to apply 50% more clamping force than with most clamps; for woodworkers, carpenters, welders, builders or do-it-yourselfers; suitable for general clamping needs; larger swivel pad reduces marring on work surface and increases stability. Features SoundSeal? noise-suppressing technology and an ANSI-certified Noise Reduction Rating (NRR) of 26 dB when used as directed with Plugfones products. Compatible with the Plugfones Guardian, Guardian Plus, Liberate 2.0, Protector, Protector Plus and FreeReign. Features SoundSeal? noise-suppressing technology and an ANSI-certified Noise Reduction Rating (NRR) of 26 dB when used as directed with Plugfones products. Compatible with the Plugfones Guardian, Guardian Plus, Liberate 2.0, Protector, Protector Plus and FreeReign. Features SoundSeal? noise-suppressing technology and an ANSI-certified Noise Reduction Rating (NRR) of 23 dB when used as directed with Plugfones products. Compatible with Plugfones Guardian, Guardian Plus, Liberate 2.0, Protector, Protector Plus and FreeReign. Lightweight plastic foam pad. Adjustable elastic straps. One size fits most. Hook and loop fasteners. Double-rolled thread for faster clamping and increased durability; large swivel pad reduces marring on work surface and increases stability; large handle for greater clamping pressure with less effort. Double-rolled thread for faster clamping and increased durability. Larger swivel pad reduces marring on work surface and increases stability. Larger handle for greater clamping pressure with less effort and reduced hand fatigue. Heavy-duty durable malleable steel frame. Copper coated steel screw with swivel pad. Baked gray enamel finish. Thick molded rubber for comfort and protection. One size fits most. Flat bottom design for added stability. Adjustable web straps with slide buckle. Rental. Patented, super soft gel material improves wearer comfort. Easy to insert and remove. High Noise Reduction. Rating (NRR 23). C-Clamp with malleable cast frame. Black oxide spindle and handle. Heavy duty swivel saddle. Throat depth 3-1/2". Used to help protect ears against noises at or exceeding 85 decibels; features a fully adjustable headband. Double-rolled thread for faster clamping and increased durability. Larger swivel pad reduces marring on work surface and increases stability. Larger handle for greater clamping pressure with less effort and reduced hand fatigue. Heavy-duty durable malleable steel frame. Copper coated steel screw with swivel pad. Baked gray enamel finish. Double-rolled thread for faster clamping and increased durability. Larger swivel pad reduces marring on work surface and increases stability. Larger handle for greater clamping pressure with less effort and reduced hand fatigue. Thick molded rubber for comfort and protection. Lightweight, one size fits most. Elastic straps with hook and loop fasteners. Thick molded foam for maximum comfort and protection. Double adjustable elastic straps for a better fit. Hook and loop fasteners. One size fits most. Heavy-duty durable malleable steel frame. Copper coated steel screw with swivel pad. Baked gray enamel finish. Heavy-duty durable malleable steel frame. Copper coated steel screw with swivel pad. Baked gray enamel finish. Double-rolled thread for faster clamping and increased durability. Larger swivel pad reduces marring on work surface and increases stability. Larger handle for greater clamping pressure with less effort and reduced hand fatigue. Comfortable hearing protection with sliding earmuff caps and an easy to adjust headband; NPR 27dB (noise reducing rating); testing according to ANSI S12.42-2010. Exclusive grooved cap design prevents thread abrasion. Super tough, lightweight fabric covering, comfortable foam padding for extra knee protection. One size fits most. Comfortable, double straps with hook and loop fasteners. Thick foam padding for extra comfort. Adjustable straps. Best durable knee protection, ergonomic design. Use For: Carpentry, Masonry, Floor Covering and Household Maintenance. Dielectric design for use around electrical hazards. Extremely soft ear pads improve comfort. Noise Reduction Rating (NRR) of 20. Tested in accordance with ANSI S3.19-1974. Used in applications such as mowing/trimming lawn, power tool use, traffic and office noise or sleeping in noisy rooms. Larger handle on this c-clamp makes it easier to apply torque for more clamping pressure with less hand fatigue; double-threaded screw reduces screw deflection and drift for faster clamping and allows you to apply 50% more clamping force than with most clamps; for woodworkers, carpenters, welders, builders or do-it-yourselfers; suitable for general clamping needs; larger swivel pad reduces marring on work surface and increases stability. Exclusive grooved cap design prevents thread abrasion. Super tough, lightweight fabric covering, comfortable foam padding for extra knee protection. One size fits most. Comfortable, double straps with hook and loop fasteners. Self-adjusting foam provides low pressure with attenuation dermatological safe foam non-irritating to the skin. Kit contains: (30) 1? x 3? adhesive plastic bandages, (2) knuckle fabric bandages, (2) fabric fingertip bandages, (1) 3? conforming gauze roll bandage, (1) 40? triangular sling/bandages with two safety pins, (8) 3? x 3? gauze dressing pads, (1) 5? x 9? trauma pad, (30) antiseptic cleansing wipes,(6) First Aid/burn cream packs (.9gms), (6) antibiotic ointment packs, (1) 1/2? x 10 yd. tape roll, (1) pair nickel plated scissors (4? ), 4? plastic tweezers (one time use), 2 pairs exam quality gloves and 1 First Aid Guide. Plastic Case with gasket, 9-1/6? x 6? x 2-3/8?. Kits have bilingual (English/Spanish) labels. 25 Person Kit. Heavy-duty construction throughout, heavy plastic front caps for easy knee swiveling. Thick foam interior for all-day comfort. One size fits most. Buckle style fastening system with adjustable straps for convenience, comfort fit and durability. Made from comfortable foam rubber. Single web strap holds them in place. Strap will not slip or bind. Soft padded ear cushions for user comfort. Adjustable headband size accommodates wide range of head sizes. High Noise Reduction Rating (NRR 24) helps protect hearing. Folds to compact size to store easily. Reclosable packaging protects during storage. These foldable ear muffs are tested in accordance with ANSI S3.19-1974. Perfect for use in the home, auto, sports. Ample room for personal medications. Be ready for all potential emergencies at home, in the car, outdoors or on the water. Supplies are easy to find in our newly designed organizer case. Kit Includes: (50) 3/4" x 3" Adhesive plastic bandages; (10) 1" x 3" Adhesive plastic bandages; (1) Knuckle fabric bandage; (1) Fingertip fabric bandage; (2) 2" x 4" Elbow & knee plastic bandages; (2) 1-1/2" x 1-1/2" Patch plastic bandages; (5) 3/8" x 1-1/2" Junior plastic bandages; (2) Butterfly wound closures; (8) 2" x 2" Gauze dressing pads; (2) 3" x 3" Gauze dressing pads; (1) 5" x 9" Trauma pad; (2) Aspirin tablets; (2) Ibuprofen tablets; (2) Extra-strength non-aspirin tablets; (10) Alcohol cleansing pads; (9) Antiseptic cleansing wipes (sting free); (2) Antibiotic ointment packs; (1) 1/2" x 5 yd First aid tape roll; (1) 4" x 5" Instant cold compress; (1) Sterile eye pad; (1) 6" x 11/16" Finger splint; (10) 3" Cotton tipped applicators; (1) Medium #2 safety pin; (2) Exam quality vinyl gloves; (1) 4" Tweezers, plastic (1) 40 pg. First aid guide; Kit Dimensions: 9-3/8" x 8-7/8" x 2-3/4". Heavy duty durable malleable steel frame. Copper coated steel screw with swivel pad. Baked gray enamel finish. Reusable hearing protection; features black cups; comfortable and lightweight; padded cups for comfort; compatible with earplugs for additional protection. Larger handle on this c-clamp makes it easier to apply torque for more clamping pressure with less hand fatigue; double-threaded screw reduces screw deflection and drift for faster clamping and allows you to apply 50% more clamping force than with most clamps; for woodworkers, carpenters, welders, builders or do-it-yourselfers; suitable for general clamping needs; larger swivel pad reduces marring on work surface and increases stability. Sure-grip shell surface. Thick foam inner pads for all-day comfort and protection. Designed for indoor tile, wood,carpet and linoleum flooring surfaces. Memory-Flex? synthetic rubber straps to fit most sizes. Flat face and deep cup design for added stability; thick-cushioned rubber for heavy industrial use; adjustable leather straps with steel buckles for secure fit; one size fits most. 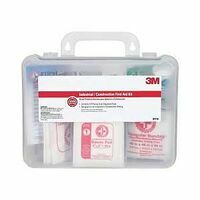 3M First Aid Kit, 118 PC Packing, 11 in Width, 5-1/2 in Length, 9-1/2 in Height, Plastic, Includes: (15) Adhesive Bandages -3/8 X 1-1/2 in, (30) Adhesive Bandages - 1 X 3 in, (1) Triangular Bandage - 40 X 40 X 56 in, (1) Adhesive Tape - 1/2 in X 5 yd, (10) Cotton Tip Applicators, (2) Finger Splints, (4) Gauze Pad - 2 X 2 in, (1) Scissors Display contains: 100 pair foam ear plugs. Soft, low ear pressure plugs are comfortable for a variety of activities. Foam rolls easily for insertion and once inserted, gently expands to fit ear canal for more comfort while providing protection. Be ready for all potential emergencies at home, in the car, outdoors or on the water. This new generation of hard kit is developed to save time and frustration in the midst of emergency situations. Supplies are easy to find in the newly designed organizer case. Kit contains: (50) 3/4"x3" Adhesive plastic bandages; (10) 3/4"x3" Fabric bandages; (20) 1"x3" Plastic bandages; (8) Knuckle fabric bandages; (8) Fingertip fabric bandages; (1) 2"x4" Elbow & knee plastic bandage; (20) 3/8"x1-1/2" Junior plastic bandages; (5) Butterfly wound closures; (12) 7/8" Spot plastic bandages; (10) 2"x2" Gauze dressing pads; (2) 3"x3" Gauze dressing pads; (1) 5"x9" Trauma pad; (2) Aspirin tablets; (2) Ibuprofen tablets; (4) Extra strength non aspirin tablets; (8) Alcohol cleansing pads; (12) Antiseptic cleansing wipes (sting free); (4) Antibiotic ointment packs; (1) 1/2"x5 yd. First aid tape roll; (1) 4"x5" Instant cold compress; (1) Burn relief pack, 3.5 gm. ; (1) Sterile eye pad; (1) Emergency blanket; (10) 3" Cotton tipped applicators; (1) 6"x11/16" Finger splint; (2) Exam quality vinyl gloves; (1) 4" Tweezers, plastic; (1) 40 pg. First aid guide; Kit Dimensions: 9-3/8"x8-7/8"x2-3/4" Be ready for all potential emergencies when on the road. Our new generation of hard kit is developed to save time and frustration in the midst of emergency situations. Kit includes: (30) 3/4"x3" Adhesive plastic bandages; (20) 3/4"x3" Fabric bandages; (2) Knuckle fabric bandages; (2) Fingertip fabric bandages; (1) 1-1/2"x1-1/2" Patch plastic bandage; (10) 3/8"x1-1/2" Junior plastic bandages; (3) Butterfly wound closures; (6) 2"x2" Gauze dressing pads; (2) 3"x3" Gauze dressing pads; (1) 5"x9" Trauma pad; (1) 2" Conforming gauze roll bandage; (4) Ibuprofen tablets; (4) Extra-strength non-aspirin tablets; (2) Motion sickness tablets; (10) Alcohol cleansing pads; (12) Antiseptic cleansing wipes (sting free); (2) Insect sting relief pads; (3) First aid /burn cream packs; (1) 1/2"x5 yd. First aid tape roll; (1) 4"x5" Instant cold compress; (1) 6"x11/16" Finger splint; (10) 3" Cotton tipped applicators; (2) Medium #2 safety pins; (1) Emergency blanket; (1) Light stick; (1) Call 911 banner; (1) Accident report form; (2) Exam quality vinyl gloves; (1) 40 pg. First aid guide; Kit Dimensions: 9"x8-1/2"x2-5/8". Neoprene fabric liner, heavy-duty, dual-layer, ballistic poly fabric and tough, textured PVC outer shell provides extra durability and protects finished surfaces from scuff marks. High density, closed-cell foam padding with core technology helps reduce pressure on kneecap for extra comfort and slip-buckle fastener system with adjustable straps. Super-lightweight foam pad. Molded body to wrap around knee. Mesh, moisture-wicking lining. Dual elastic straps with hook & loop closure. Kit contains: (100) 1" x 3" adhesive plastic bandages, (2) knuckle fabric bandages, (2) fabric fingertip bandages, (1) 3" conforming gauze roll bandage, (1) 40" triangular sling/bandages with two safety pins, (8) 3" x 3" gauze dressing pads, (1) 5" x 9" trauma pad, (42) antiseptic cleansing wipes,(6) First Aid/burn cream packs (.9gms), (6) antibiotic cream packs, (1) 4" x 5" instant cold compress, (1) 1/2" x 10 yd. tape roll, (1) pair nickel plated scissors (4"), 4" plastic tweezers (one time use), 2 pair exam quality gloves and 1 First Aid Guide. Plastic Case with gasket, 9-1/6" x 6" x 2-3/8". Kits have bilingual (English/Spanish) labels. 25 Person Kit. Super thick 1/2" high density, closed cell foam for all day comfort. Large caps for more protective coverage. Two-strap fastening for added stability. One size fits most. Kit contains: 1 bx of (16) 3/4" plastic adhesive bandages; (6) B2K antiseptic towelettes; (1) 1-3/4" x 2" fingertip fabric bandages, (1) 2" x 4" knee/elbow plastic bandage, (1) 36" x 36" x 51" triangular sling/bandage with 2 safety pins, (4) 2" x 2" gauze dressing pads (2-2 packs), (2) 4" x 4" (1 -2pk) gauze dressing pads, (4) 3" x 3" (2-2pks) gauze dressing pads, (1) each of 2" x 4.1 yd. & 3" x 4.1 yd. gauze roll bandages, (1) 5" x 9" trauma pad,(1) sterile eye pad, (6) alcohol cleansing pads, (3) triple antibiotic ointment packs, (1) burn relief pack (3.5 gm) (1) 6" x 9" instant cold compress, (6) aspirin tablets (3 -2-pks), (1) roll of 1" x 5 yd. tape. (1) pair of nickel plated scissors (4-1/2"), 4" tweezers, (1) pair of vinyl gloves, (1) First Aid Guide book. Plastic Case with gasket is 7-11/16" x 4- 9/16" x 2-3/8". 10 Person Kit. Pads have a heavy duty smooth cap to keep padding around knee. Ballistic poly material provides strength and durability while the grooved cap design helps prevent thread abrasion, slip-buckle fastener system with adjustable straps and comfortable foam padding for all day wear. Double thickness felt lining for all-day comfort; heavy-duty leather; adjustable leather straps with steel buckles; riveted for extra strength; one size fits most. Superior comfort and protection; designed to be a high noise reducing/protection earmuff; adjustable, vented headband design reduces heat build and improves comfort when worn with hats. NPR 30db. Provides maximum cushioning for all-day wearability. Super-accordion, ultra-flex construction for comfort and protection. Durable rubber straps adjustable to fit all sizes. Kit Contains: (50) Adhesive plastic bandages, 3/4" x 3"; (3) Large fingertip fabric bandages; (2) Knuckle fabric bandages; (1) Triangular sling/bandage, w/2 safety pins, 36"; (6) Gauze dressing pads, 2" x 2"; (1) Conforming gauze roll bandage, 2"; (1) Trauma pad, 5" x 9"; (1) Sterile eye pad; (12) BZK antiseptic towelettes; (6) Triple antibiotic ointment packs; (3) Insect sting relief pads; (1) Eye wash, 4 oz. ; (1) Instant cold compress, 4" x 5"; (12) Aspirin tablets, (6) 2-pks; (1) First aid tape roll, 1/2" c 5 yd. ; (1) Scissors, 4-1/2", nickel plated; (1) Tweezers, 4", plastic; (2) Exam quality, vinyl gloves, 1 pair; (1) First aid guide. Low-pressure plugs for added comfort. Expandable foam fits wide range of ear canal sizes. Body heat-sensitive foam makes insertion easier. Comes with dispenser box for added convenience. High Noise Reduction Rating (NRR 32). Features SoundSeal? noise-suppressing technology, IsoTalk? noise isolating microphone, and Quickdraw? easy access control. Interchangeable ComforTiered? Silicone and ComforTwist? 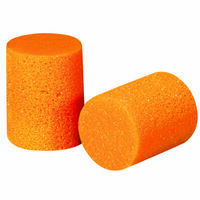 Foam tips with ANSI-certified Noise Reduction Ratings (NRR) of 26 dB and 23 dB. Features tuned speaker and double-reinforced jack. Includes waterproof case and cable management clip. Features SoundSeal? noise-suppressing technology, IsoTalk? noise isolating microphone, and Quickdraw? easy access control. Interchangeable ComforTiered? Silicone and ComforTwist? Foam tips with ANSI-certified Noise Reduction Ratings (NRR) of 26 dB and 23 dB. Features tuned speaker and double-reinforced jack. Includes waterproof case and cable management clip. Features SoundSeal? noise-suppressing technology, IsoTalk? noise isolating microphone, and Quickdraw? easy access control. Interchangeable ComforTiered? Silicone and ComforTwist? Foam tips with ANSI-certified Noise Reduction Ratings (NRR) of 26 dB and 23 dB. Features tuned speaker and double-reinforced jack. Includes waterproof case and cable management clip. Kit contains: (100) 1" x 3" adhesive plastic bandages, (2) knuckle fabric bandages, (2) large fabric fingertip bandages, (1) 3" conforming gauze roll bandage, (1) 40" triangular sling/bandages with two safety pins, (8) 3" x 3" gauze dressing pads, (1) 5" x 9" trauma pad, (42) antiseptic cleansing wipes, (6) First Aid/burn cream packs (.9gms), (6) antibiotic ointment packs, (1) 4" x 5" instant cold compress, (1) 1/2" x 10 yd. tape roll, (1) pair nickel plated scissors (4"), 4" plastic tweezers (one time use), 2 pair gloves and 1 First Aid Guide. Metal Case with gasket, 10-1/2" x 7" x 2-1/2". Kits have bilingual (English/Spanish) labels. 25 Person Kit - Metal Case. Gel technology and thick foam padding surrounds knee for added comfort. Accordion-style upper knee cover keeps knee in place without restricting movement. Full size, all-terrain cap design engineered with air cushion chambers provides stability and protection even over rough surfaces. Neoprene fabric liner helps keep knees comfortable throughout the day. Slot and Dot fastener system with flexible rubber straps for comfort and easy adjustability. Layered gel technology over thick, closed-cell foam padding surrounds knee for support and comfort. Ballistic poly material provides strength and durability. Non-skid, heavy-duty cap, convenient upper tab for easy repositioning on knee, large, adjustable neoprene strap for comfort and stability, neoprene fabric liner and a slip-buckle fastener system with adjustable straps. Kit Contains: (125) 1? x 3? adhesive plastic bandages, (5) knuckle fabric bandages, (5) fabric fingertip bandages, (2) 3? conforming gauze roll, bandage, (2) 40? triangular sling/bandages with two safety pins, (12) 3? x 3? gauze dressing pads, (2) 5? x 9? trauma pad, (60) antiseptic cleansing wipes,(6) First Aid/burn cream packs (.9gms each), (6) Antibiotic ointment packs, (2) 4? x 5? instant cold compress, (1 Bx) 1/2? x 10 yd. First Aid tape roll, 2/bx,(1) pair nickel plated scissors (4? ), 4? plastic tweezers (one time use), 2 pairs gloves and 1 First Aid Guide. Plastic Case with gasket: 9? x 9-3/16? x 2-3/4?. Kits have bilingual (English/Spanish) labels. Hard cap for swiveling or sliding. HV retro reflective meets EN1150 worldwide standard. Gel padded for maximum comfort. Neoprene lining for maximum comfort. Neoprene straps with tri-buckle closure. Hard cap for swiveling or sliding. HV retro reflective meets EN1150 worldwide standard. Gel padded for maximum comfort. Neoprene lining for maximum comfort. Neoprene straps with tri-buckle closure. Designed for fleet and commercial vehicles. Its hard metal case with gasket holds quality brand products that are easily accessible in an emergency. This kit meets federal OSHA recommendations and offers easy refilling with the help of a full color reordering schematic. Refills are color coded for ease of identification. Kit contains: (1) A-100: 3/4"x3" Adhesive plastic bandages, 25/bx; (1) A-102: 5 Knuckle, 5 large fingertip fabric bandages; (6) 3"x3" Gauze dressing pads, (3) 2-pks; (1) 2" Conforming gauze roll bandage; (1) 36" Triangular sling/bandage, w/2 safety pins; (10) Ibuprofen tablets, (5) 2-pks; (1) B-304: Antiseptic cleansing wipes (sting free), 18/bx; (4) Triple antibiotic ointment packs; (1) AN-404: Burn relief packs, 6/bx; (1) 1/2"x10 yd. First aid tape roll; (1) B-503: 4"x5" Instant cold compress, 1/bx; (2) Sterile eye pads; (1) Eye wash, 4 oz. ; (1) AN-5112: Exam quality vinyl gloves, 2 pr/bx; (1) 4" Scissors, nickel plated; (1) 4"Tweezers, plastic; (1) First aid guide: Kit Dimensions: 6-5/16x9-1/16"x2-3/8". The MP3/AM/FM stereo hearing protector ear muffs balance comfort, protection and the ability to listen to the radio or MP3 player. Features includes: noise reduction rating of 21dB; meets ANSI S319-1974 and CSA Z94.2-02, Class B; retains 82dB safe noise cut-off, even with MP3 player in use; automatic radio shut-off when MP3 is connected; free auxiliary cord and 2 heavy-duty AA batteries. Kit contains: 1 bx (100) 3/4" x 3" adhesive plastic bandages, (1) 1/2" x 10 yd First Aid tape roll, 1 bx (1) 36" x 36" x 51" triangular sling/bandage with 2 safety pins, (1) 2" x 5 yd. latex free elastic bandage, (2) 2" x 4.1 yd gauze roll bandages, (1) 3" x 4.1 yd. gauze bandage, 2 bxs (12) 2" x 2" gauze dressing pads (3 2-pks/bx), 2 bxs (4) sterile eye pads, 1 bx of (18) antiseptic wipes, (1) bx of 10 triple antibiotic ointment packs, 1 bx of (10) insect sting relief pads, (1) 4 oz. eye wash, 1 bx CPR pack with: 1 rescue breather, CPR one way valve face shield, (2) large latex gloves, and (3) antiseptic cleansing wipes. 1 bx 4" x 5" instant cold compress, 1 bx (20) aspirin tablets (10-2pks), 1 pair nickel plated scissors (4-1/2"), 1 plastic 4" tweezers, (2) pair gloves, (1) BX 5" x 9" Trauma pad and 1 First Aid Guide. Plastic Case is 10-3/4" x 11-1/4" x 3". 50 Person Kit. MP3 connectivity, stereo input jack with patch cord for MP3s, CD players or scanners, easy-to-read LCD display for precise tuning and memory preset for up to 10 AM/FM stations, antenna with high reception sensitivity, comfortable gel foam ear cushions, adjustable padded stainless steel headband. Specs: NRR 22 dB, 140 hours of operating time. AA batteries not included. The comfortable fit of soft foam ear plugs with the convenience of a cord. Recommended for moderate to high noise (up to 100 dBA TWA). This general business kit is ideal for businesses, offices, and work sites. Metal cabinet has swing out door and easy to carry handle. Cabinet design eliminates disorganized and missing supplies. Clearly labeled compartments. Kit includes: (25) 1? x 3? fabric bandage, (5) knuckle fabric bandage, (5) fingertip fabric bandage, (25) 3/4? x 3? plastic bandage, (1) 40? triangular sling/bandage, (1) 2? gauze roll bandage, (1) 3? gauze roll bandage, (1) 1/2? x 10yd first aid tape, (10) 3? x 3? gauze dressing pads, (1) 5? x 9? trauma pad, (10) antiseptic cleansing wipe (sting free), (10) antibiotic ointment, (10) first aid/burn cream, (1) 3? stainless steel tweezers, slanted, (1) first aid guide, (2 pairs) exam quality vinyl gloves, (1) scissors. OSHA compliance. Features SoundSeal? noise-suppressing technology, Bluetooth? 4.1, NeverOut? battery with up to 12 hours of play, Fast Charge technology, IsoTalk? noise isolating microphone, and Quickdraw? easy access control. Interchangeable ComforTiered? Silicone and ComforTwist? Foam tips have ANSI-certified Noise Reduction Ratings (NRR) of 26 dB and 23 dB. Features tuned speaker. Includes nylon zipper case, USB charging cable, and cable management clip. Features SoundSeal? noise-suppressing technology, Bluetooth? 4.1, NeverOut? battery with up to 12 hours of play, Fast Charge technology, IsoTalk? noise isolating microphone, and Quickdraw? easy access control. Interchangeable ComforTiered? Silicone and ComforTwist? Foam tips have ANSI-certified Noise Reduction Ratings (NRR) of 26 dB and 23 dB. Features tuned speaker. Includes nylon zipper case, USB charging cable, and cable management clip.